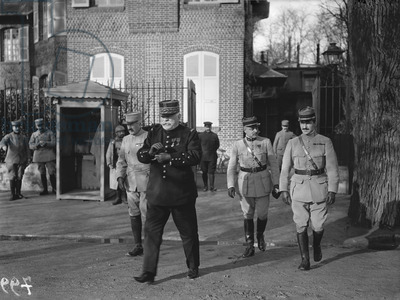 In order to work out and coordinate its plans, the Entente held a second conference at Chantilly in December 1915. Russia’s new representative, General Zhilinsky, once again tried to achieve really clear and simple objectives with the coalition partners. The Russian command insisted that an attack on the Western and Eastern fronts should be carried out at the same time! There should be no time lapse between the start of operations conducted by separate armies. The Russian general also tried to reach a solution regarding an immediate attack by the other Allies should any one of them be attacked by the Germans, even if preparations for such an attack had still not been completely finalised. The conference heard Zhilinsky and completely agreed that what he had suggested would not allow the enemy to freely manoeuvre with reserves. And that was that! Only the general provisions were approved, no specific objectives were worked out. The dates of future offensives were determined in a memorandum composed by the French General Staff. Initially, everything was planned as General Zhilinsky had requested – a simultaneous attack on the Western and Eastern fronts – but then “small” amendments were introduced. According to the updated all-Allied plan, the attack on the French front was planned for 1 July 1916 and on the Russian front – two weeks earlier. Just enough time for the Germans to redeploy their divisions by rail to the Russian front. In other words, in the plan prepared by the English and the French, Russia was once again saddled with the main burden of the war and subsequent events changed nothing, regardless of any changes in the political and military situation. For some reason, historians seem to steer clear of an interesting pattern: no matter which country entered the war, and it did not even matter whose side they were on, Russia was the only country that became worse off! Romania’s entry into the war on 27 August 1916 is a fine illustration of this. Or rather it is indicative of that perseverance with which the “Allies” drew Bucharest into it. “From a military point of view, it posed a definite problem for Russia”, Mannerheim wrote. There is a widely known view which a variety of authors attribute to various military authorities. The gist of it is this: it was not important whose side Romania entered the war on because the amount of military power needed to destroy it or escape from it was exactly the same. And therein lay the “problem”: Romania’s entry into the war was of no benefit to the Entente, but it would cause considerable damage to Russia. Romania’s military power was very weak, but the country shared a lengthy border with Russia. Should Romania enter the war, the Russian front would automatically be extended. Filling it would use up all of Russia’s reserves and weaken other sections of the front. Which is exactly why the English used every effort to force Bucharest into the war. In order for the Romanian government to be able to enter the war with a light heart, British diplomats promised them territorial gains at the expense of Austria-Hungary and maintained the extraordinary assurance that Romania would be able to declare war on Austria alone. And so it was that the Romanians entered the war, but war was declared on them by Germany, Bulgaria and Turkey. The situation was quite astonishing: the members of the Entente, fighting against one and the same enemy, had diametrically opposed points of view on Romania’s entry into the war. Exactly as it had been with Turkey. There is nothing surprising about it, however. It was simply that Russia’s true goals for entering the war and her Allies’ were different, thus the difference in their approach. In this regard, the reaction of the head of the French command, General Joffre, is indicative: after finding out about Romania’s entry into the war, he proclaimed enthusiastically: “There is absolutely nothing to regret!” You will understand why the French General was so overjoyed if you look back at the events leading up to Romania’s entry into the war. The Russian offensive (the Brusilov Offensive) was over at the end of August 1916 and, immediately afterwards, the Romanians announced their decision to enter the war on the side of the Entente. After which they launched an attack on Hungary, having put some pressure on Austrian troops. Germany reacted immediately. The Germans spent two months regrouping and then on 11 November 1916, German troops launched their offensive under the command of General Mackensen. After quickly defeating the Romanian army, the Germans reached Bucharest where they completely destroyed any remaining Romanian troops in three days during the Battle of Bucharest and entered the capital. In a matter of days, the Romanian army lost 120,000 people who were either killed or captured and virtually ceased to exist. “Romania asked Russia for help at the very outset of military actions and the size of this help increased continuously as the German and Austro-Hungarian offensives progressed. By the beginning of spring 1917, there were 36 Russian infantry and 6 Russian cavalry divisions on the Romanian front, which was some 500 kilometres long. This meant that the Russian army had sent approximately one quarter of its troops to Romania and was left with almost no reserves itself. On top of that, Russia was supposed to supply the Romanian army with food and equipment, but by that time Russia’s own situation was getting worse by the day. It is a textbook example of how a weak ally brings more worries than it is able to give help! “, General Mannerheim wrote in his memoirs. French Marshall Joffre erupted with demands that 200,000 Russian soldiers be sent to save Romania. The Romanian ambassador Diamandy pestered the Tsar with a plan by the Bucharest General Staff that the Russians concentrate 3-4 corps, force through the eastern Carpathian Mountains and hit the flank of the advancing Germans. The “Allies” were demanding the impossible: there was simply nowhere to get that many troops from in such a short amount of time. Therefore, without refusing to help Romania, Tsar Nicholas II and General Alekseev rejected the proposed plan. That many reserves were just not available and the withdrawal of troops would inevitably leave the front exposed and could lead to the enemy breaking through somewhere else. But it would seem that this is what the “Allies” were striving for. Their hysteria was indescribable. Diamandy ran to complain to Paléologue who sent a message to Paris, and from there they pushed and they pushed. As it turned out, it was Russian forces that saved the Romanians in the end anyway, since British forces were “stuck” at the Macedonian front and were unable to “fight through” to help Romania. This could have been easily predicted. Russian troops always went to help their allies, while the English and French always had a convincing reason at hand to explain why they had not done so themselves. “With regard to Romania,” wrote A. Zaionchkovsky, a well-known Russian military theorist and a corps commander at the Romanian front, “the Entente gave a fine example of military-political discord.” In the sense that they urged Romania to enter the war, but did not safeguard the country against defeat. Guess why! Where were the German troops who defeated the Romanians taken from? From the Western front, of course! Consequently, Romania’s entry into the war weakened both Russia and Germany: an even greater number of German and Russian troops fought against each other, which was entirely in keeping with the “Allies'” script. There were less German troops on the Western front and more on the Eastern front, and just like that the hardships of war were imperceptibly shifted over to the Russians who were already suffering huge losses. The Russian army began to have even less artillery and weapons per kilometre of front. Arms deliveries from the Allies were not as they had been, while new German divisions never forgot to take their own artillery with them. The First World War is literally like a kaleidoscope of such unsightly examples of English politics that at some point one ceases to be amazed at their treachery. But in fact, the story surrounding Romania’s entry into the war stands out from the rest, as it has one more hidden meaning. In order to understand it, you just to need to familiarise yourself with Russia’s plans from this period, which were also well known to the “Allies”. Following the unexpected landing of the English and French in Gallipoli, an uneasy Tsar Nicholas II ordered that a plan be worked out to seize the Straits which were so strategically important for Russia. The governments of the Entente, you will recall, did not object verbally, but they came to conclusions and they took measures. And here we are once again approaching another rather interesting moment. It seems that the divisions that had been covering the emerging “Romanian” gap at the front had been preparing for the Dardanelles Operation! They were redeployed to the Romanian front having abandoned the operation to seize the Straits and Constantinople!